Linkin Park have announced that their new album, A Thousand Suns, will be released worldwide on 14 September. The disc was co-produced by Rick Rubin, who oversaw their 2007 effort, Minutes To Midnight. The first single from the new album will be The Catalyst, which debuts on radio worldwide on 2 August and will also be featured on the band's MySpace Music profile. Prior to the song's release, the band and MySpace are teaming up for 'Linkin Park, Featuring You,' a unique promotion that gives fans a first-of-its-kind opportunity to collaborate with the group to produce their own song based on some of the tracks from the forthcoming single. In other words, think you can beat Linkin Park at their own game? Then prove it! 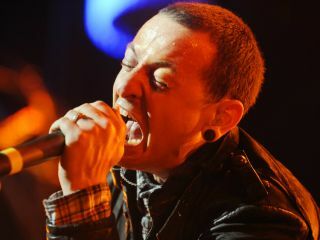 A winner will be chosen by Linkin Park and the cut will either be included on the band's new album or the winner will be invited to perform with the band on a song on the upcoming record. Starting today, 9 July, fans can go to myspace.com/linkinpark to download audio stems from The Catalyst. Fans will be encouraged to adjust the stems and also record and produce their own additional tracks. Fans can use their own music production software to create their song and then upload it to the band via their MySpace page. Once each new version is submitted, the track will be shared in an embeddable player, which anyone can access to rate and comment, as well as click through to record their own tracks. "Our albums are the foundation of who we are as a band, and reserving a spot for a fan to play on one of our songs felt like a way to show our dedication to them," said co-vocalist Mike Shinoda. "There are a lot of unknowns about what might get submitted for this contest, but that's what makes it fun. Our fans continually energize us with their creativity and dedication, so I think they're going to come up with something great." Linkin Park (Shinoda, vocalist Chester Bennington, drummer Rob Bourdon, guitarist Brad Delson, DJ Joe Hahn and bassist Dave "Phoenix" Farrell) also recently announced that they'll be touring Europe this fall, beginning Wednesday, 20 October at the O2 World, Berlin and wrapping Wednesday, 11 November at the 02 Arena, London.